Mohammad Shakir, DO is a cardiologist at Loyola Medicine. His clinical interests include echocardiography and general cardiology. 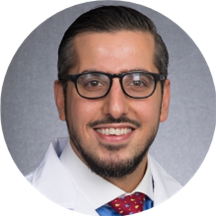 Dr. Shakir is an assistant professor in the Department of Medicine at Loyola University Chicago Stritch School of Medicine. He earned his medical degree at the Midwestern University, Chicago College of Osteopathic Medicine. Dr. Shakir is always excellent. He is interested in what I have to say, takes feedback very seriously, and has a way of providing comfort by simply knowing what he's doing and explaining it in easily understood ways. I value adoctor who can work collaboratively with a patient, and Dr. Shakir is a pro.